I was here: The farewell for Cadiz – Go ask Alisa – DIY capsule wardrobe one stitch at a time! They say “All good things come to an end” – this morning I woke up with a bittersweet nostalgia since our good friends and amazing house mates, Spanish couple Sophia and Jack , left yesterday for good back to Spain. We have spent so many hours talking and chatting in the hall ways, cooking meals, fighting invader mice and dealing with day-to-day routine that we never had a chance to talk about our heritage. They knew I am Russian, I knew they were Spanish – end of story. Eventually, there is more to tell. Keep reading. Preparing farewell evening for our housemates started off with cooking some African chicken from our chef of the house Regina (amazing girl, feature of next post), slicing and dicing some fruit salad and warming up the talk with a blend of British teas. Talk went on and on: plans for the future, remembering the recent past. But I never knew until then that they, Jack and Sophie, both come from Cadiz – the place among many other fancy European cities that I do love the most. Small, yet very rich and exotic, this city has a story to tell. As we realized that besides the house, memories about Cadiz is what we also have in common. It took me back in time, as a wave of hot Spanish summer it wrapped us up and enlightened the evening with a special touch. Lucky I was to get to visit Cadiz couple of times: I do remember it in a sunshine, I have seen it in storm. As this is a thin slice of land in the middle of the sea, water is so close that it almost scares you. When flashbacks about Cadiz appeared the very first memory that I had was the scenery of city rooftops. As colorful and unpredictable as Easter eggs, any shade, any pattern, you name it. As one of the oldest cities in the Europe Cadiz has been influenced by Catholic church: little chapels, bigger cathedrals, the religion that walks hand-in-hand with every day life of locals. I cannot pride myself as a great believer, but Cadiz showed me this fragile connection between believing and trusting religion. As small as it seems, this beautiful heaven on Earth has a bigger story between the lines. Take your chance – visit Cadiz. 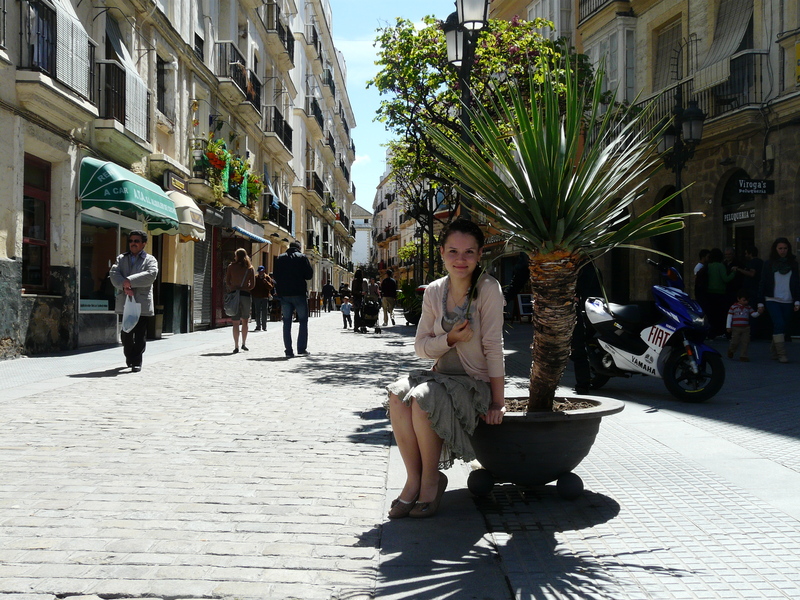 Cadiz, my favourite place on Earth…miss it. In Storms, In sunshine but never in mid-summer with 6 million tourists! I agree, it just has something to it! This little interesting twist, a curved story that makes it worth visiting this place! But as any other tourist destination – it changes its pattern during the vacation season, sadly. I love how you speak about Cádiz and I hope you come back some day (if it’s with Reginna it will be perfect). You two have a home in Cádiz, our home will be your home. I would have liked to spend more time together but I’m very shy and I need more time for it, Anyway, Jack and me are very happy for meet you, definitely the best housemates we have had in England, thank you very much for everything. I hope we don’t lose contact between us. A lot of kisses for you, Reginna and Kennedy. We will see each other, one way of another, but we will! All the best to you guys, keep in touch and oh, enjoy that wonderful home of yours!!! Lots of love! Next Next post: Today is The day: Her Birthday!